Mathieu Meulenaere, the center bass drummer from Showband Calypso (Belgium), sent in this one. "This is a picture taken during our latest camp that shows who the bass brothers are. The tight friendship on and off the field is the glue that keeps us going on and on beating those drums. 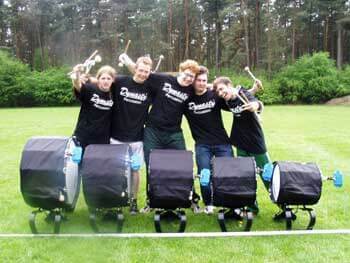 It would be fun to see this picture on DCI.org, because in Belgium the activity is very small and not known by a lot of people Peace to my bass brothers, Calypso and the whole Belgian activity! "From left to right are Duffy, Digidy, Dicky (me), Ducky and Donkey."